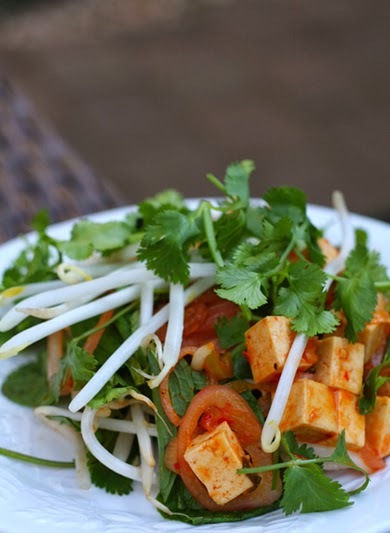 A local Lao restaurant Panoy Bistro in Grass Valley offers many delicious vegan options on their menu. 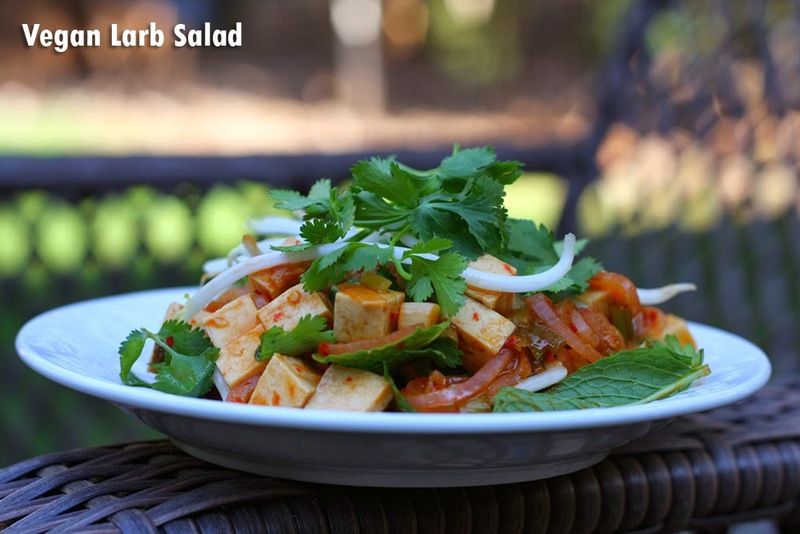 My favorite is their vegan Larb salad, a mixture of sweet and spicy. Larb is a meat-centric dish, normally containing minced meat and fish-based sauce. It is the national dish of Laos. I was craving the dish and found a few recipes that I veganized, closely duplicating the restaurant version (for a fraction of the price). This is one of the easier ways to adapt your diet to be more plant-based - pick some of your favorite recipes and have fun creating plant-based/vegan versions. So here is my veganized version of Larb salad! 1. Whisk together the first four ingredients. 2. Bring vegetable broth to simmer in large sauce pan over medium-heat. Add cubed tofu. Simmer until liquid reduced by half, stirring occasionally, 10-12 minutes. 3. Add green onions, sliced shallot, and chili to sauce pan. After a couple minutes, add sauce from step 1. Stir until liquid is almost all reduced, another 5-10 minutes. Option 1: Cool off until room temperature or in refrigerator, then mix in cilantro, mint, and mung beans. Option 2: Immediately add in cilantro, mint, and mung beans. Serve warm. If you made it too spicy, add additional lime juice to cut the heat. This made two servings and cost me about $1.70 per serving for a total of $3.40 for the meal. Your costs may vary dependent on availability of ingredients. I always have extra ingredients, so I will make this salad several days in a row with the fresh ingredients.